Our team has been pretty busy dealing with hackers and DDoS issues but we got a lot of questions about the Halloween patch so we decided to push out the essentials :). These wings only appear once a year! A special collectible item that only goes on sale for ONCE a year. After the sale, they are removed from the D-Shop. They are a Halloween special. I've seen some players that still have the Halloblade wings from last year, they are indeed one of the rarest wings of the game. If you want to be unique, stand out, and leave people wondering where you got your wings, these wings are for you! Halloblade wings will be removed from the D-Shop on November 1st. Every year, after these wings are removed, people constantly ask players who are wearing them where and how to get them. At that point, there is no way until next October :). 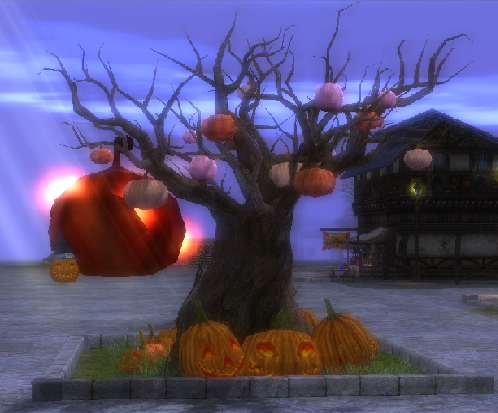 Halloween decorations have been put up! Beware of ghosts, it seems Ardeca has gotten very dark! 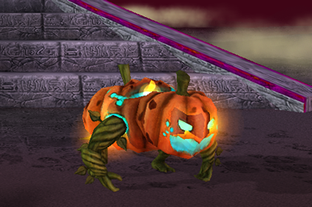 Pumpkin Ghouls have crawled out of hiding! They seem to be feeding in only a few maps right now. The candyes repaired? Because all candyes was bugged and make lower the def and attack. Candyes not work, still bugged! You can test easily, just give segnale buff to anyone, who want to use the candy. Please fix that, or worthless the event! Emblems never write the good exponation date. V2, V3, Mc, Mc2 also not showen. Also have big bug with the list, just play a little the Price dil short by button. I have tons observation , but maybe next time. Also OPR Glycien tell me in the Ardeca center i cant use Arogans and pickup pet at city. If you dont want problems, why not use only Pumpkun who not attack? Also why candy not work? So I get banned, because i stand with Aroggans and pickup pet, as afk farmer and the drop make debuff? Ok I agree i farm afk at Ardeca, lol. Also why dont fix the Gazrow middleman list? Also have big bug with the list, just play a little the Price dil short by. And if i speak with OPR and say him/her i found bug with event, why he/she say me: "shout up"??? multiple time, when I sad the bug? He/she dont speak english? I dont agree with 7 day ban, because I use 2 pets at center of Ardeca in the rest zone! This is the wrong section to make a ban appeal. You may create a ban appeal in the proper support ticket (ban appeal) section if you want a reply from an executive staff member on your ban. The primary thing is how you can test the candyes what still not work. I don't get ban yet, I just say if i get ban i dont agree, this is just the secondary thing in my letter. Any form of AFK Farming is bannable and clearly explained in our Terms of Service posted on our website and log-in screen.